09.06.11 Win a chance to see the former TV host's second doc, More Business of Being Born, before its release. Ricki Lake is a busy lady these days! Not only is she one of the newly announced contestants for the upcoming season of Dancing With The Stars, but the former talk show host is also getting ready for the release of her new documentary, More Business of Being Born. Three years ago, Lake and her business partner, filmmaker Abby Epstein, had much success with Business of Being Born, a documentary about childbirth in the United States. Its follow-up further "explores the modern maternity care system while offering a practical look at birthing options for American women. "The message is really about choices and exploring birth options," Lake said in an interview with People magazine's Celebrity Babies blog. "I want a woman to be able to give birth in the way in which she chooses." As a bonus, the new movie features a number of celebrities—from Christy Turlington Burns to Laila Ali to Gisele Bundchen—sharing their birth stories. "Gisele was incredible. Abby went to her house in Boston and she [Gisele] was in tears" talking about her amazing birth experience, Lake reveals in the People interview. 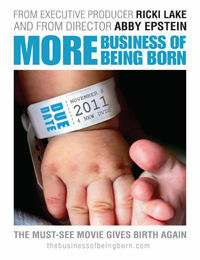 More Business of Being Born will be released nationwide on DVD Nov. 8, but Fit Pregnancy readers have a chance to get a free sneak peek. Ten readers will be chosen as winners to receive a special code to watch the movie online before its official release. For a chance to win, head over to our Freebies page to enter to win a special code to watch previews of More Business of Being Born. And don't forget to watch Lake as she competes for the Dancing with the Stars' mirrorball trophy, starting Sept. 19 on ABC.